It's not everyday that I see an exhibit from a friend of mine in the MoMa New York, but last Sunday was one of them. 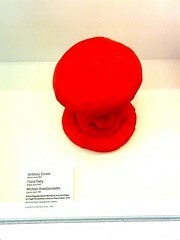 Anthony is Professor at the Royal College of Art in London. We met last year when he asked me to speak to his Design Interactions Masters students and I recall he showing me one of the Atomic Mushrooms presented here in the MoMa.